← FAGBUG: To Be or Not to Be Fabulous? I think living in a small, rural town for so long turned me off to the idea of “say it loud, say it proud” and instead I just remained quietly proud – if that is even a thing. Um, sure, I think it is. Anyway, my point: I loved arriving back on the scene of everything pro-gay by crashing into it with a rainbow car. Within five days I went from silent celebrator to someone who can feel the rainbow fire burning inside of me again. And all of this came to be because of each person we came into contact with while on the trip. Whether all they did was take our picture as they drove by us, or do a fifteen minute interview explaining their stance on gay marriage, I took everything that happened to heart. And I came out on the other side of the country feeling a whole lot more like my old self. We were up early in western South Dakota as we hoped to take some pictures of the car with Mount Rushmore before continuing on down the road. The usual happened and we ended up not making the time that we had originally hoped to. Meandering up to Mount Rushmore was interesting because there was a shot we wanted to get before entering the park where you can see the mountain from the road. This quick turn in the road was a hot spot for people trying to get photos of the mountain, so we got honked at a number of times as we did our usual – put the car in reverse in an area where we probably shouldn’t and leave me on the side of the road with a video camera. First glimpse of Mt. 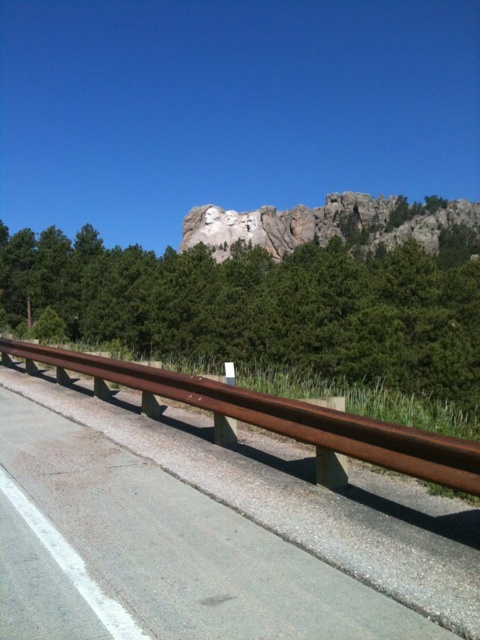 Rushmore from the side of the road. Not the best place for picture taking, but certainly not the worst either. 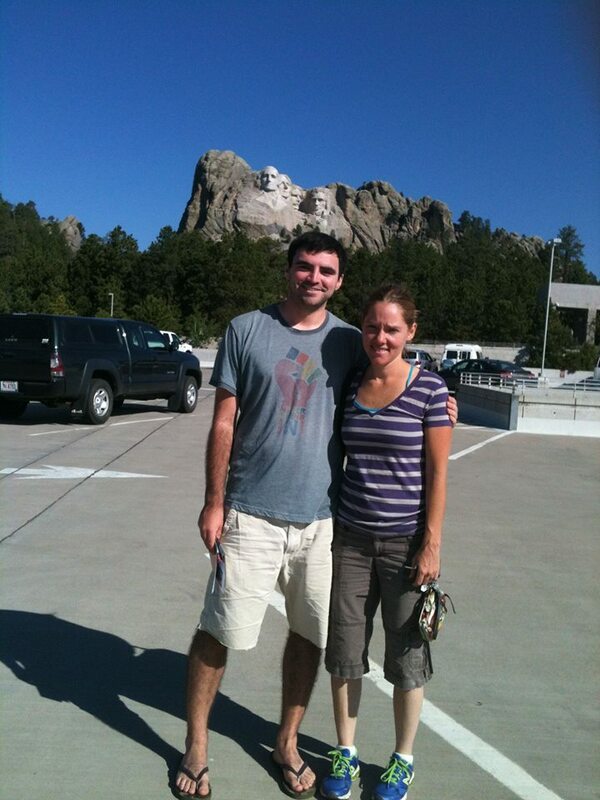 You can get into Mount Rushmore Park for free, but they make you pay for parking, which is the only lot within a reasonable distance. So…it’s $11 to get in. We probably only hung around for about an hour, there were miles and miles to go before our next destination. 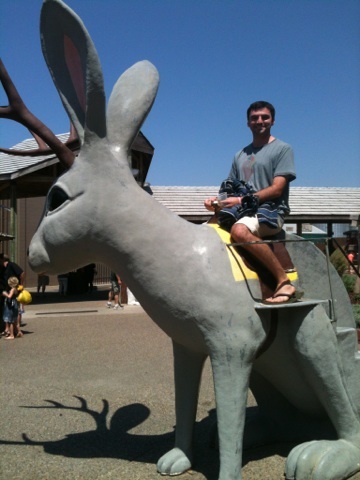 After Wall Drug, the flatness continued and the Fagbug pressed on, making it’s way across another ridiculously long state. This was the state where I took note of the large number of people snapping photos of us as they drove by. Cars tend to get up in the lane beside the Fagbug and then hover next to it just long enough to snap a photo. I didn’t appreciate it when the driver was the only one in the car and still tried to take a picture, but you can’t control other people. It was fun to retaliate and film them back as they snapped pictures of the car. 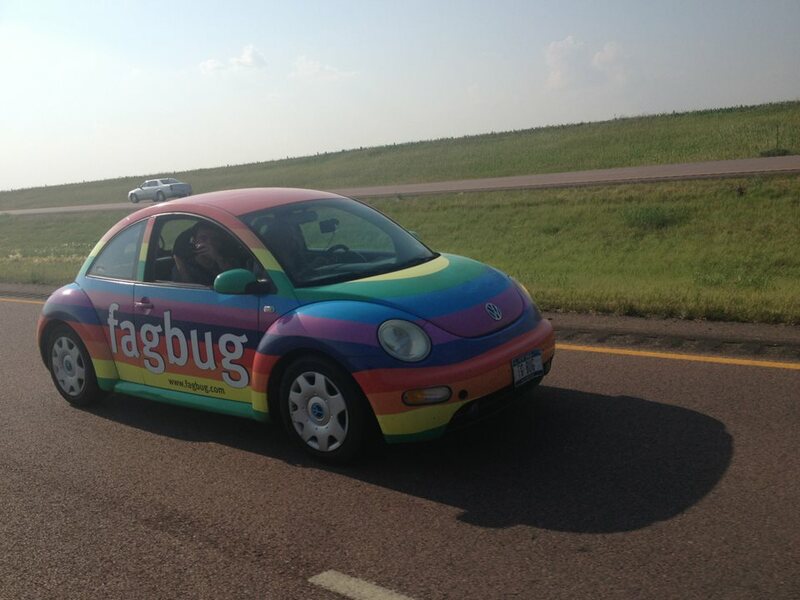 A fan of Fagbug uploaded this to the facebook page after taking this photo. Look closely, you can see me filming them back. Also, note the FLAT landscape. This, our third day on the road, would end up being the most driving and filming we would dedicate to a single day. As we crossed into Minnesota from SD, evening was upon us and our goal was to make it to Milwaukee. We scored two more unexpected interviews along the way, one in South Dakota and one along the southern edge of Minnesota. The first interview was a guy who wasn’t able to hold back yelling “groovy” as he walked into the gas station we were re-filling at. Erin worked her magic and got his story. The next, was a cute couple in their late-60’s who owned a gas station and mini-mart just off of the highway in a farm community. There wasn’t much else around other than the gas station. The woman took note of the car as I was buying a drink at the counter. She got her husband’s attention and directed him to look at the “cute” car outside. I explained our story to them and the next thing they knew, they were being interviewed for the documentary. A few unexpected (yet important) detours and our arrival time at our destination kept creeping further and further into the night. I remember Minnesota as one big blur. When we first entered into the state we got three thumbs up in a row from passing cars, but the exhaustion of having traveled all day quickly took its toll on both of us Fagbuggers. I think we hit some construction along the way in Minnesota, but perhaps that happened once we crossed over into Wisconsin. Crossing into Wisconsin around 10 or 11pm? I’ll skip ahead to the end of Day 3, which bled into Day 4, for the sake of time. 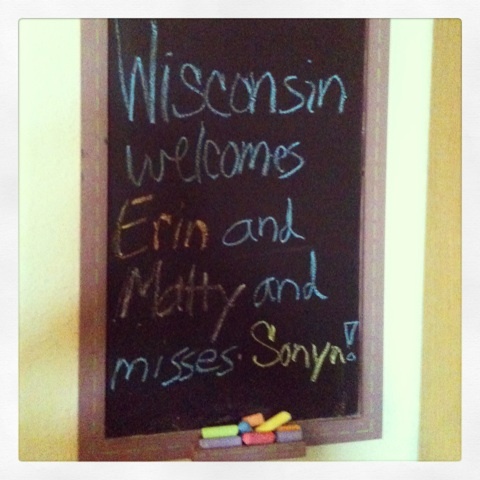 We made it to our destination in eastern Wisconsin at about 5:30 the next morning. So, we got up at 6:30am and stopped driving at 5:30am…23 hours. I wish I could explain how sad it was to see the sun coming up and to still be driving, but I’ll let you imagine that for yourself. By the time we got to our destination, Erin pointed out how unsafe it was for us to have been driving that long. I’m still amazed no one took note of the fact that we only had one headlight and had driven through literally every hour of darkness. A nice gesture for some weary travelers. This entry was posted in Gay and tagged dark, documentary, Erin Davies, Fagbug, Fagbug movie, Fagbug Nation, Gay, gay pride, Matty, Minnesota, Mount Rushmore, Mt. Rushmore, night, Pride, Rainbow, Rainbow car, South Dakota, tired, Wisconsin. Bookmark the permalink. I can’t imagine sitting in a car for that length of time, let alone driving. A definite endurance feat.